The Target Saver: Target: Use Your Smartphone! Nivea Body Wash, Only $1.04! Target: Use Your Smartphone! Nivea Body Wash, Only $1.04! Right now you can use just your phone to pay $1.04 for Nivea Body Wash at Target! Take a look out for Nivea Care & Happiness Body Wash for $1.38 at your local Target. Add a 25% off Cartwheel offer to your Target app to save even more. This is a lower price than I've seen for Nivea and I would stock up. Remember Cartwheel offers can be used four times per transaction, up to six times per day. 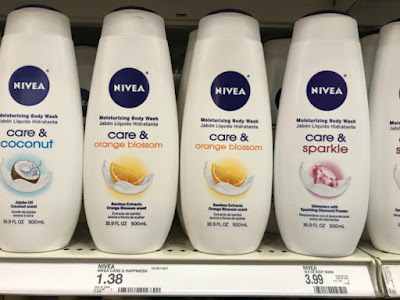 To check the price and find Nivea Care & Happiness Body Wash in your store, go to brickseek.com and type in your zip code along with the nine-digit DPCI inventory number 049-00-0598.